PETRA HAS BEEN described in National Geographic magazine as being “JORDAN’s city in the rock.” There is no doubt, however, that Petra, located south of Amman on a semiarid site at the edge of the Wadi Araba mountainous desert, is a wonder of the ancient world. Originally developed at the crossroads of overland trading routes, Petra developed as the capital of the Nabatean Empire (c. 400 B.C.E. to 106 C.E.). Utilizing the local sandstone rock faces—the colors of which vary from white to cream to red and brown— the Nabateans carved tombs and temples into the rocky outcrops. Using their knowledge of hydraulic engineering the Nabateans cut water channels and tunnels into the rock so as to bring drinking water into the developing city from a local dam. Entering Petra via a narrow channel (the Siq) between two large rock faces, the walkway leads directly to one of the city’s most important former edifices, the 131-ft- (40-m-) high Khazneh (treasury), the front of which is dominated by a huge Roman portico. Despite the remarkable exterior, the Khazneh’s interior contrasts greatly and is simply formed. The old heart of Petra lies on open ground around an area known as Wadi Musa. A Roman roadway from the Khazneh leads to the area and is lined with impressive columns. The Roman legacy can be further seen by the layout of a marketplace and amphitheater. However, other prominent structures include the gateway of the temenos and temples such as Qasr-al Bint Firaun (the Castle of the Pharoah’s Daughter) and the Temple of the Winged Lions. 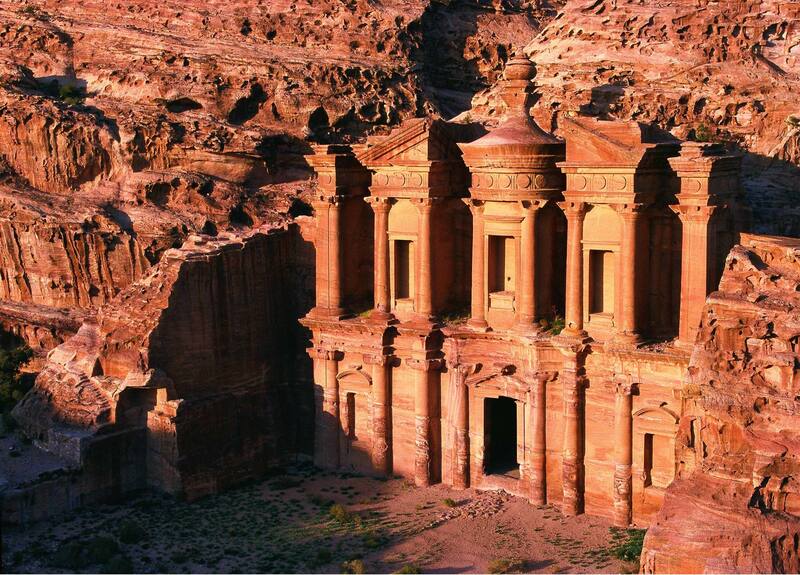 Annexed by the Romans in 106 C.E., Petra slowly declined as a commercial center in the following centuries. The arrival of the Byzantines in the 4th century did not greatly change the fortunes of the settlement, partly because of earthquakes and an economic lull. Thus, at the end of the Byzantine Empire (circa 700 C.E. ), Petra was in a poor condition, buildings were in near ruin, and the incredible dignity of the city established under the Nabateans was all but lost. In the following centuries, the name of Petra was maintained in local folklore but lost to the West until 1812 when a Swiss explorer, Johann Burchhardt, discovered the ancient settlement. Today, to protect the remaining city, the Jordanian government has moved the local Bedouin population to houses away from the historic core.